(Buteo jamaicensis) is a large North American hawk, and one of two species also known as the Chickenhawk. Birds of this species have a dark mark along the leading edge of the underwing, between the body and the wrist (the patagium). Most but not all color variations have a dark band across the belly. In most, the adults' tails are rusty red above, and juveniles have narrow brown and pale bands. The main western population has bands on the adults' rusty tails as well and has varied plumage, organized into three main color types. Coloration: The usual color is a dark brown on the head and back, and rusty streaks or a rusty wash over the breast and belly, with dark spots on the tips of the upper belly feathers which, at a distance, give the bird a dark belly band (one of its main field identification traits) and a rusty "red" tail, which is gray and whitish from underneath. There is a wide range of color variation in the Red Tail and one can find specimens dark brown ventrally (with a black belly band), making a completely dark bird (easily confused with another Buteo, the Rough-legged Hawk) and, on the other end, a light brown dorsum with a cream head and belly (with small spots, so the belly band is still evident) and pink tail. Zoo: Bird of prey diet - 3 times a week. Birds are given meat on the bone or fresh kills on the regular keepers 2nd day off. Wild: Small mammals, snakes, lizards, frogs, fish and insects. They kill rabbits, ground and tree squirrels, but also catch birds up to the size of prairie chickens. 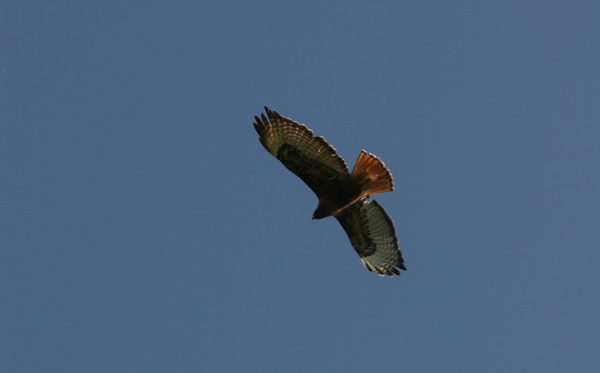 Typical of all Buteos, the Red Tail is a master soarer and takes advantage of daily thermals in the summer months. In cooler weather, these birds must rely on perch hunting. An extremely versatile raptor, it combines the characteristics of soaring and the rapid flight of accipiters. Like all Buteos, they are often seen perched on a prominance (rock, fence post or telephone pole) patiently watching for prey. As with all raptors, pellets are regurgitated and food-habits studies are easily carried out.